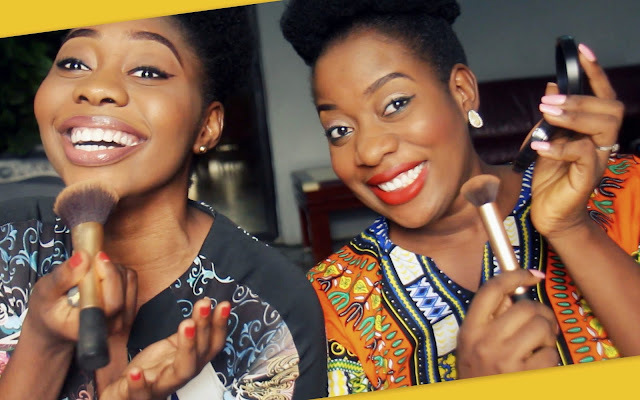 WATCH ME DO MY MAKEUP IN 5 MINUTES : 5 MIN MAKEUP CHALLENGE WITH TOSIN ALABI! OMG! Tosin is so much fun! I had an amazing time. Thanks babe for making my day! This video is the makeup one, you can check her channel for the one we did about Blogging in Nigeria, I'll share it later! You guys really look alike!! Lovely collabo Yemi & Tosin! Lovely!...but please this 5 minute makeup video has to go....because so many women (a.k.a Me ) will get in trouble for taking so long to get ready!hahaha...why are you guys selling us out now....ok ok ok..I'm going to show hubby and repent..on Sunday i'll be ready for church on time! Forget oh. I won't even try. 5 minutes ke? It's not that I use a lot of makeup, but that I am just slow at applying it. But una do well oh. Lol. Lovely video, you guys look amazing! You both are so real..... Kept laughing. I think both of you won. Lobed the glam look and the natural look as well. Kudos ladies.